Kickboxing uses blending strategies of two sports, one is simple boxing, other is martial arts style punches and the basic motive is to overcome the opponent in all ways. Though kick boxing is based on self defense, this sport is a great way to keep fit. During practice a boxer will make use of various styles of punching along with other physical movements, i.e. lunges, ducking and even rolling. Kickboxing has started to become very popular, compared with other conventional workouts. Weighted Back End: Neoprene is used in the manufacturing of these gloves and zipped pouches are used in these gloves so that they can easily be adjusted according to the weight. These gloves are made keeping in mind the adjustability as well as flexibility and this is the main reason that open palm designs are made. Weighted Front End: These gloves are manufactured according to the suitability of the athlete. These gloves are designed with the sole aim of providing more protection to hands. 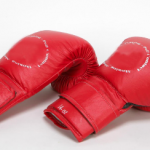 Weighted gloves are varied according to the requirements of the person and an athlete can choose specific glove depending on the stamina that he has to maintain in the game. Gloves are just one important part of kickboxing equipment. If your current gloves are starting to show wear and tear around the seams, then it is time to purchase a new pair. Cuts and tears on seams can lead to injury and cuts during sparring, and it is the responsibility of every athlete to insure that their equipment is in perfect condition. Generally during sparring events, referees will check to make sure that contestants have proper equipment. If an kickboxer fails to have correct and safe equipment, you can risk being not allowed to participate. Quality should be the sole criterion when picking a pair of gloves. The person who is making purchase of these gloves; should check the quality completely, also check to see if the gloves come with a guarantee. A known brand can provide more satisfaction in comparison to cheaper/generic brands. As an athlete is expected to exhibit performance, and generally good quality materials help this. Not only these gloves increase the stamina of the person but performance of a person highly improves. Right size of gloves is also very significant as inappropriate dimension is likely to affect the performance of a person. Generally there are two measures you need to take care of. The first is that the width of the glove is sufficient, that you hand can lay flat in the glove. Secondly the glove is small enough so that you can touch the top of it even when your fist is clenched. Ask your coach for recommendations of brands of kickboxing gloves, they may know what type of gloves suit your ability level. Consider looking online as there is often great bargains to be found, on sites like EBay etc. So, these tips should be considered before purchasing kick boxing gloves. Kickboxing gloves increase the stamina of athletes and a person should acquire gloves of high quality, to allow them achieve their goal.